XOR is still a widely used method for encryption, but: What is XOR? To understand this I first have to teach you something about ports. In this case, switch 1 AND switch 2 are pressed, the lamp switch on. There are many possible combinations, for example the NAND and NOR port, a combination for Not AND and Not OR. As you may have noticed the result is just the opposite of AND and OR. But what can we do with this? If I take 65=”A” we can also write this binary. The binary system uses only 0 or 1, the kind of switches I explained. Binary 65 is 01000001, you can simply calculate the binary number when you put the decimals above them because every bit (binary digit) is the power of the previous one. All switches on 11111111 = 128+64+32+16+8+4+2+1 = 255, along with 0, there are 256 possibilities. 00011011 and that’s decimal: 27. So, I give you the number 27 and you should find out which characters I've used here? That’s not possible of course, because there are many possibilities that can cause 27. And what exactly was that again: 65 and thus “A”. So… if I have “Z” and XOR it with the encrypted data I can get back “A” again! Encrypting with a letter and encrypting again with the same letter leads to the original letter! 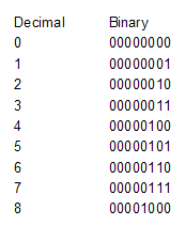 As you can see, the "decimals" of the hexadecimal system exactly match with the single bit values of the binary system. There are several methods to hack passwords, one of them called "Brute Force" Brute force is nothing more than trying all possibilities until you come across something that makes sense. If you do that by hand can take a long time, but: We have a computer! A computer might be stupid, but it is fast also, it can easily test a 100,000 combinations per second. If I would use brute force to this I could use only the “A” to het 1/3 of the text correct. So I really only need 26 tests to perform and see what times 1 / 3 of the text looks good. You see the repetitive pattern back when you try to hack. But XOR Cryptology is still used, why? With long passwords which uses all characters it works fine, patterns are very difficult to find, if not impossible. Let's say you have a password of 12 characters, upper and lower case and special characters and numbers. You then have 82^12 possibility’s = 92,420,056,270,299,900,000,000. The computer would then take about 29,306,207,595 years to crack the code as it does 100,000 combinations per second. Big super computers are a lot faster, but it would still take at least 5,861,242 Year to crack this with brute force. Who sais its not safe enough? We have now seen that brute force is really not an option for long complex passwords with XOR technology. How should we do it than? Search patterns, in many possible ways to find combinations. Try to capture them in an algorithm, and then we know what makes a cryptologist, pattern search, determine algorithms. What do we need to hack: preferably a very long text and a very short password. The shorter the encrypted text and the longer the password, the harder it is. But a very important thing for finding passwords and algorithms is this: What is the name of the owners wife, what are his children’s names , his pet, what year was he born, how does he usually choose his password. What keeps him busy. Can I install something on his computer to “catch” his password. 9 of 10 people who just have a new love, choose a password the name of their love, number combinations are often combinations of birth date or the date that they met or married. That and more can all be important factors for a real cryptologist. The next time I will explain RSA encrypion :) Do something with prime numbers Yeah nice!